Boston Public Market | Boston Public Market at Seaport Every Wednesday! Boston Public Market at Seaport Every Wednesday! May 2018 – Boston, MA – WS Development is pleased to announce this summer’s return of its Seaport farmer’s market, which first debuted in 2017. In a new partnership with the Boston Public Market Association, this year’s market, named Boston Public Market at Seaport, expands on previous offerings and places great emphasis on local, family owned businesses. Running June 6, 2018 through October 31, 2018, Boston Public Market at Seaport will be held every Wednesday at One Seaport from 11:30am-6:30pm. Courthouse Square is located at 60 Seaport Boulevard Boston MA 02210, www.bostonseaport.xyz. At the market, Seaport residents, workers, and visitors alike will find fresh produce, farm-fresh meats, off-the-boat seafood, baked goods, and picnic fare. Nine local Massachusetts and New England vendors, including Baking with Joy, Stillman’s Farm, Red’s Best, and When Pigs Fly will partake in Boston Public Market at Seaport. Tuscan Kitchen, which has an expansive restaurant directly above the market, will also be on site selling fresh made pastas, cured meats, sauces, breads, and desserts. “Our guiding principle in the Seaport is always to bring the community together in enjoyable and accessible ways. We are very excited to join forces with the Boston Public Market Association to host the Boston Public Market at Seaport, which will bring the best of Massachusetts agriculture into the heart of the city for all to enjoy. We look forward to kicking off the season on June 6th,” says Yanni Tsipis, Senior Vice President of Seaport, WS Development. “A major part of our mission at the Boston Public Market is to nourish the community with local, fresh food,” said Cheryl Cronin, CEO of the Boston Public Market. “We’re thrilled that for the first time, in addition to our flagship location at 100 Hanover Street and seasonal market at Dewey Square on The Greenway, Boston Public Market at Seaport will broaden its reach to Boston residents, workers, and visitors. We’re grateful for the opportunity to partner with WS Development on this market." 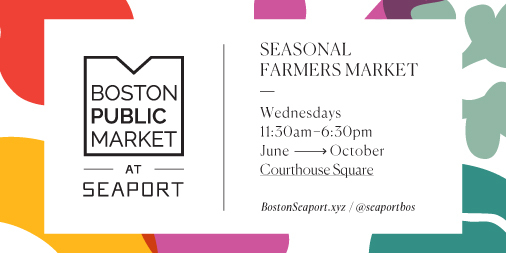 In addition to the new Seaport location, the Boston Public Market at Dewey Square on The Greenway will return for the season on Tuesday, May 15, 2018 and will operate Tuesdays and Thursdays, 11:30am-6:30pm. Visit bostonpublicmarket.org for a full list of vendors. A family owned and operated livestock farm in the heart of Massachusetts selling grass-fed and pasture raised beef, pork, lamb, goat, and poultry, as well as eggs and all natural rubs. Culture, industry and community converge making Boston’s Seaport district a dynamic and vibrant area that is quickly emerging as one of the most exciting neighborhoods and destinations in the country. Currently, Boston’s single largest development project, WS Development will transform 23 acres of waterfront land with a carefully selected mix of residential, hotel, office, retail, entertainment, civic and cultural uses, and public open space. Combining the best of historic and modern day Boston, Seaport is positioned to become the destination for fashion, culture, arts, dining and entertainment, and technology and life sciences, expanding its position as one of the top cities in the world. For more information visit www.bostonseaport.xyz, follow Boston Seaport on Facebook, and @SeaportBos on Instagram and Twitter. WS Development is a Massachusetts-based property developer dedicated to the creation of places where people want to be. With more than 20 million square feet of existing space and an additional five million under development, it is one of the largest privately-owned development firms in the country. In business since 1990, WS is a vertically-integrated company that develops, owns, operates, and leases over 90 properties, including urban buildings, lifestyle centers, power centers, community centers, and mixed-use developments. Its goal is to be a contributing member of each community it serves. WS takes pride in its commitment to its roots, reflected by its properties in and around New England, but also finds great satisfaction in immersing itself in new locales and expanding its national portfolio. For more information, visit www.wsdevelopment.com, call 617.232.8900 or follow WS Development on Linkedin.